Whatever you're hauling or storage needs are, in large quantity or small, Tiger has the containers in stock to get your project moving. 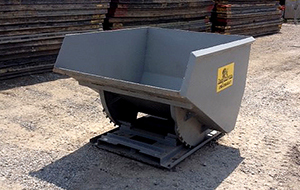 Tiger provides skip pans, baskets and yard tilt hoppers for clients in various industries. Whether you are moving tools, equipment, valves or waste, we have a large variety of crane baskets to choose from. At Tiger, we adhere to all industry standards and safety practices while providing the best service in the industry. Tiger's waste containers/logistic baskets are constructed of the toughest materials to ensure safety while hauling or transporting substances. 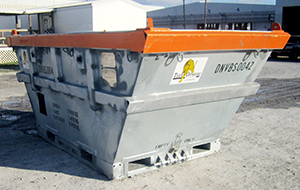 We have ample options for specialized uses, such as additional tie downs, saddle support for containing round objects, side door access for easy loading on some DNV 2.7-1 baskets, and rubber seals on open baskets to make them fluid containment capable. Our units meet industry standards for labeling details such as load capability, and the top rails are painted safety orange for high visibility in high-activity environments common to construction sites. We have developed an extensive and growing product line to provide our customers with an ergonomic and economical solution to various application needs. In addition to the many standard products we offer, we also custom manufacture products to suit almost any application requirement. We pride ourselves in providing high quality baskets for our customers across the globe for use on drilling rig sites, LNG work sites, Refineries, Construction sites, Maintenance jobs... Whatever you need to transport, our trained personnel will help you get it moved.